Rehabilitation with the help of semi and fully automatic controlled robots are emerging for assistance and therapy. It is a multidisciplinary field requiring participation from Engineers (electronics, control, mechanical design, biomechanics, etc) and doctors & Physiotherapist. The robotic devices are developed for assisting different sensorimotor functions of the arm, hand, leg, ankle and also full body in extreme case. The rehabilitation is also more effective and efficient with development of therapeutic training and quantification of sensorimotor performance. Indeed, there is a high demand to develop simpler mechanism with patient tailored adaptive control to assist the individuals suffering of motor impairments, due to stroke, spinal cord injuries, etc. This workshop will cover the knowledge dissemination for development of intelligent robotic aids, mechanical design and control. The end-user and Industry perspective will also be explained. The workshop is aimed to create an international network of similar researchers from India and France, for the benefit of human kind. Both Indian and French coordinators of the present workshop have in disposal different rehabilitation experimental facilities. 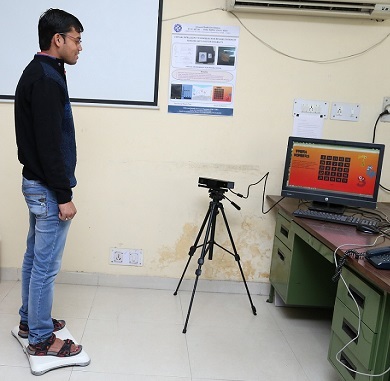 The Indian partner has in disposal three experimental setups for this project, namely: an exoskeleton system, a postural stability system and a virtual rehabilitation system. 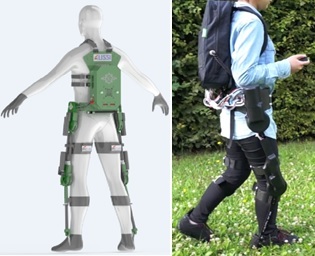 The exoskeleton system: It consists of a wearable exoskeleton suit, powered by actuators and a closed-loop control system to drive the mechanism. An array of six electro goniometers comprises the feedback system of the controller. 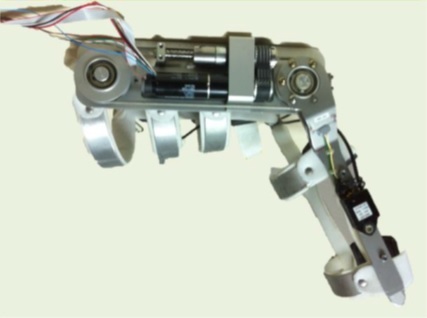 Depending on the feedback from goniometer, an angle-based control algorithm is there to drive the actuators for generation of the desired pattern of movement of the limbs. The exoskeleton has the functionality of independent exercise of the individual joints of the lower limb. It allows achievement of selective control of the movement of joint with predefined speed. It features 6 Degree of Freedom (DOF) augmentations, one DOF for each hip, knee and ankle joints. The twin wearable legs are powered by actuators, all controlled by a real-time microprocessor, which receives data from the sensors attached to each joint. The control algorithm is developed using LabVIEW FPGA platform. The data manipulation and the user interface design is done on LabVIEW real-time environment. The device has multiple software modes for operation, sit-to-stand mode, walk mode, therapy mode, etc. The device is powered by rechargeable battery and can support 30 minutes of walking. The electronics, controller and the battery is packaged into a backpack to be worn by the subject. The wearer can operate the device through a touch display. The walk parameters can be recorded for analysis and quantification of gait rehabilitation. 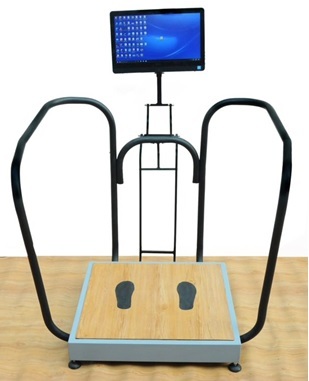 The device can assist a person of up to 100 kg with a height from 5 to 6 ft in gait activities. Postural stability system: It is a device to measure the center of pressure during static and dynamic conditions. The platform assesses the postural instability of the patients. The system calculates the real-time pressure at the metatarsal and heel region of the foot. There are therapeutic modules also attached to the system that helps patients to increase the range of stability through visual feedback. Virtual rehabilitation system: It is a virtual intelligent platform for motor rehabilitation of persons with disabilities. It combines experience from virtual reality and knowledge from machine intelligence to enhance neural reorganization that optimizes the physical rehabilitation outcomes in individuals with disability. It provides stimulating sensory feedback to promote motor learning and encompasses tools that help to understand the biology of disability. Quantification of motor disability is done through presenting the individuals with situations/tasks that require the use of groups of muscles and body parts like an augmented rehabilitation measure such as Virtual Function Reach Test. The French partners have in disposal two experimental setups available at LISSI laboratory, UPEC University. 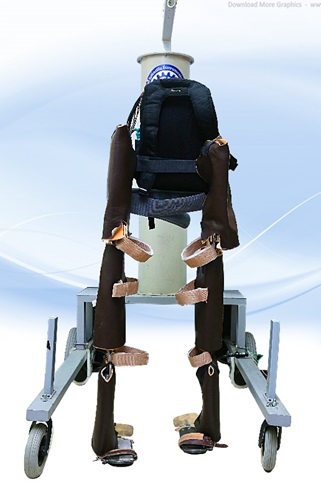 EICOSI Exoskeleton: This prototype was developed at LISSI laboratory - UPEC university. The Exoskeleton Intelligently COmmunicating and Sensitive to Intention (EICOSI) has a rotational degree of freedom at the knee joint level and is composed of two segments: an upper one that embodies the thigh and a lower one that embodies the shank. The electromechanical structure of EICOSI fits the morphology of the human leg, to which it is fixed by means of straps, so that the shank-foot-exoskeleton system rotates synchronously. Lower-Limbs exoskeleton: This prototype was also developed at LISSI laboratory et UPEC university. I is named E-ROWA, that states for Exoskeletal-Robotic Orthotics for Walking Assistance. The exoskeletal frames are attached to the wearer’s legs by means of straps. At the hip and knee joints, four actuators are used respectively to actuate the exoskeleton. The maximum output torque of each actuator is about 30 Nm. Each joint is equipped with 13 bit encoder that measures the associated joint angle. Four FSR sensors (Tekscan, Inc.) are fixed on the toes and heel parts of each shoe. A National Instruments board card is used to control the exoskeleton actuators.